The dunes of Merzouga are one of the more popular attractions when visiting Morocco. 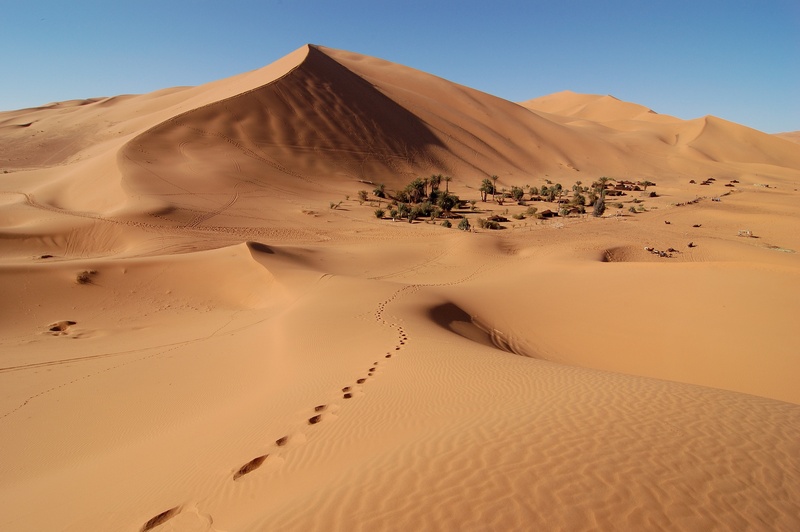 What is a trip to Morocco without visiting the Erg Chebbi, which is Morocco’s most genuine Saharan dune or erg, which is a drifting sea of sand dunes that travels from Algeria into Morocco. Visitors to the Erg Chebbi usually feel a magical calmness as they watch the the sunrise and sunset over the Erg Chebbi, transforming the colors of the dunes from a golden hue to a deep red. Merzouga is the nearest village to the Erg Chebbi and it is an impressive walk towards the dunes and further into the dunes. Once you are away from modern light, you will get to appreciate the magnificient star lit sky and the impressive moon as her lights softly filters over the desert’s dunes. In Merzouga you have the amenities of a modern town including hotels, however we do find camping at an authentic desert camp at the edge of the dunes to be more of an adventure than spending the night in a hotel. But as you like, since Morocco Why Not is here to make your trip a unique adventure by giving you a camel ride into the desert, or for those who would like to kick their heels back in a 4×4 Jeep for a wild ride into the dunes. Our overnight trips includes a bed in a Berber tent, breakfast and dinner. Call us today for more information about our desert trips.